IRVINE, Calif. – Eighty-five House seats. Five governor’s mansions. Five senate seats. Hundreds of local and state legislative races. The June 5 primaries, which spread across four time zones and eight states, represent the biggest single day of elections until November. By Wednesday morning, Democrats should know whether they have been locked out of House runoffs in California, whether they’ve nominated the first female Native American candidate for a winnable House seat, and whether they put down left-wing rebellions from New Jersey to Montana. Republicans will know their Senate nominee in one of five deeply red states won by President Donald Trump and learn whether incumbents who have criticized Trump can still win primaries. Months of Democratic worries about being locked out of the November ballot should come to an end Tuesday when voters in three Orange County congressional districts decide who to advance to the general election. (However, the absentee ballot system might make candidates wait for days to see which of them made it onto the November ballot.) In California, the top two candidates in any race, regardless of party, advance to the general. That system cost the Democrats a House seat in 2012 and is now being tested in races where two to four serious Democratic candidates refused to quit. Democrats remain nervous about lockouts in the 49th, 39th and 48th congressional districts. In the 49th, the party might be saved by Republicans rallying around Diane Harkey, a county official endorsed by retiring Rep. Darrell Issa, R; as she’s moved up in polls, the odds have grown that the second slot goes to a Democrat. In the 48th, the Democratic Congressional Campaign Committee has spent more than $1 million to boost businessman Harley Rouda and attack Republican Scott Baugh; the party is hopeful that Rouda can climb over Baugh to make a runoff with Republican Rep. Dana Rohrabacher. The 39th district has remained a quagmire, with six Democrats on the ballot and a Republican advantage in early voting. Those Orange County seats, however, are just three of the seven Republican-held California districts that backed Hillary Clinton over Trump in 2016. Democrats are more confident about making runoffs in Central Valley races against Republican Reps. David Valadao and Jeff Denham and bullish on two Los Angeles-area districts with Republican incumbents: the 25th, represented by Rep. Steve Knight, and the 45th, represented by Rep. Mimi Walters. 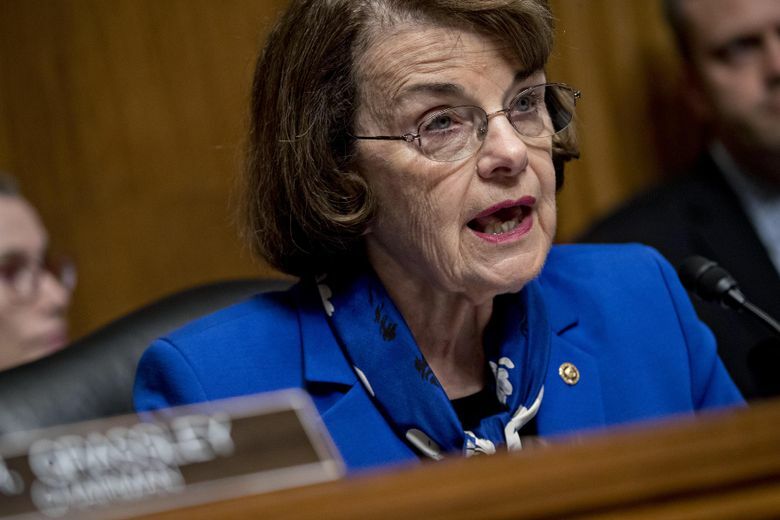 There is less drama in the race for the state’s biggest prizes, the Senate seat held by Democrat Dianne Feinstein and the governor’s mansion, which is being vacated by Gov. Jerry Brown, D.
Feinstein, who has broken with her party on issues that include the death penalty and the Iraq War, has run as the candidate of “California values” and built a massive lead over more than 31 challengers. State Sen. Kevin de Leon, who hoped to consolidate “progressive” support, is not assured a runoff slot; polling has found second place going to everyone from de Leon to an unknown businessman with no FEC report to a white supremacist to a San Diego businessman who’s running for Senate in seven states to prove a point about ballot access. The drama has also faded in the race for governor, with no candidate able to dislodge Lt. Gov. Gavin Newsom, D, from first place. Both Newsom and the Trump White House hope that Republican John Cox, a businessman who lost three elections in Illinois (and a quixotic presidential bid) before moving to California, will win the second slot. Some down-ballot Democrats are hoping for a surge by Antonio Villaraigosa, the former mayor of Los Angeles, which would lock Republicans out of the race. Republicans described the special-election victory of Sen. Doug Jones, D-Ala., as an accident; Democrats saw it as the first evidence in years that they could compete in the Deep South. The party is contesting every House district, and it has a crowded primary in the governor’s race for the right to take on Republican Kay Ivey, with Tuscaloosa Mayor Walt Maddox ahead in money and endorsements. Ivey, meanwhile, has largely consolidated support from party leaders but is still facing three Republican challengers, led by Huntsville Mayor Tommy Battle. The twist: Eight years ago, Bright was a Democratic incumbent and was defeated by Roby for the seat. Bright has switched parties and become one of four Republican challengers to Roby. If the congresswoman gets less than 50 percent of the vote, she’ll face a July 17 runoff. Democrats, who were obliterated across the state in 2014 and 2016, are looking for comebacks in two races that had been reshaped by scandal. The Democratic campaign for governor, which just weeks ago looked like a dogfight between philanthropist Fred Hubbell and state legislator Nate Boulton, changed when Boulton quit overnight after the Des Moines Register published evidence that he had made unwanted advances to women. If Hubbell falls below 35 percent of the vote, Democrats will pick their nominee at a convention. That scenario might play out in two House districts, especially the Des Moines-based 3rd, now held by Republican David Young. A candidate who had been highly touted by national Democrats quit the race after a campaign staffer forged some of her petition signatures, creating a three-way race. Among the candidate is Pete D’Alessandro, Sen. Bernie Sanders’s 2016 campaign manager in Iowa. There’s a four-way contest underway in eastern Iowa’s 1st Congressional District, which Democrats held from 2007 to 2015, then lost to Republican Rep. Rod Blum. State legislator Abby Finkenauer, who at 28 would be the youngest-ever woman elected to Congress, has led in fundraising and endorsements. Democrats are playing for at least three of this state’s five Republican-held House seats, campaigning against the 2017 tax cut that passed despite howls of protest from both parties in New Jersey. Tuesday’s most revealing contest will come in South Jersey’s 2nd Congressional District, where Republican Frank A. LoBiondo is retiring without a clear successor from his party. Jeff Van Drew, a conservative Democratic legislator whom the party had recruited for years, is the heavy favorite over three self-styled “progressive” candidates. Democrats will also pick nominees for two GOP-held seats that broke for Hillary Clinton in 2016. In the 7th district, represented by Leonard Lance, former assistant secretary of state Tom Malinowski is the best-funded Democrat in a three-way primary. In the 11th, which Republican Rodney Frelinghuysen is leaving after 24 years, national Democrats are bullish on Mikie Sherrill, a Navy veteran and attorney who has raised nearly $3 million. No serious Democrat emerged to challenge Sen. Robert Menendez, D, despite a years-long corruption trial that sank his approval rating, even after he beat the charges. Republicans are set to nominate Bob Hugin, a pharmaceutical chief executive making his first bid for office. The real drama will come in November, in a “jungle primary” to decide whether appointed Sen. Cindy Hyde-Smith, R, will fill out her term. Tuesday’s only contest will come in the safely Republican 3rd Congressional District, where three women and three men are battling to replace Rep. Gregg Harper. Mississippi is one of just five states that has never elected a woman to the House, but the three biggest fundraisers in the open-seat race are the three front-running men. It’s been 17 months since Ryan Zinke left Congress to become the Trump administration’s interior secretary, but the aftershocks are still being felt in Montana. Republicans, who had seen Zinke as their strongest candidate against Democratic Sen. Jon Tester, had to settle instead for a crowded primary. Democrats watched now-Rep. Greg Gianforte, R, nearly fumble away a May 2017 special election for the state’s sole House seat against a folk singer who had never run for office. Now five Democrats, four of them men, want to face him. In the Senate race, Republicans now believe that State Auditor Matt Rosendale is the favorite in a four-way field, helped by the Club for Growth. That worries some state Republican leaders, who have backed retired judge Russell Fagg and see the Maryland-born Rosendale as a flawed challenger for Tester. But there’s been little ideological division in the primary, with every candidate pledging to replace Tester with a loyal Trump vote. As in most of the Southwest, Democrats have been advancing in New Mexico: In 2016, Donald Trump won less of the state’s vote than any Republican presidential nominee in 80 years. Most of this year’s action is in Democratic primaries, with the party hungry to take back the statehouse and hoping, as they did in 2008, to win all three seats in Congress. For months, Rep. Michelle Lujan Grisham has been the Democrat to beat for governor, with the final public polling putting her at 57 percent in a three-way race. Her two rivals have closed out the race with a gift – the revelation that Lujan Grisham misstated her income from a group that helped implement the Affordable Care Act. But Democrats still expect her to prevail and face Rep. Stevan Pearce, R, for governor. If elected to replace retiring Gov. Susanna Martinez, R, Lujan Grisham would be the first woman to replace another woman in a state’s top job. The race for Lujan Grisham’s Albuquerque-based seat also presents the chance of a “first” – Deb Haaland, the former chair of the state Democratic Party, would be the first Native American woman to serve in Congress. But polls show her tied with two other candidates. Republicans, meanwhile, will pick their nominee to replace Pearce – a race Democrats are watching to see if a weak nominee leaves an opening for them. The governor’s mansion and the state’s at-large House seat are both empty this year, and Republicans will pick their nominees to maintain their party’s control. The gubernatorial primary pits Rep. Kristi L. Noem, R, against state Attorney General Marty Jackley. Noem has attacked the “Pierre status quo,” and Jackley has attacked her as an ineffective member of Congress. Republicans also will settle a nasty primary for Noem’s seat, with former gubernatorial chief of staff Dusty Johnson seen as the front-runner over state elections chief Shantel Krebs and state Sen. Neal Tapio. Johnson has portrayed himself as a pragmatist and criticized the Trump administration’s threatened agricultural tariffs, while Krebs and Tapio have said they support Trump’s trade policies. Democrats have no such drama, with state Sen. Billie Sutton and former judge Tim Bjorkman unopposed for governor and House.